See also NS67SE 4 and LIN 17. (Location cited as NS 657 739). 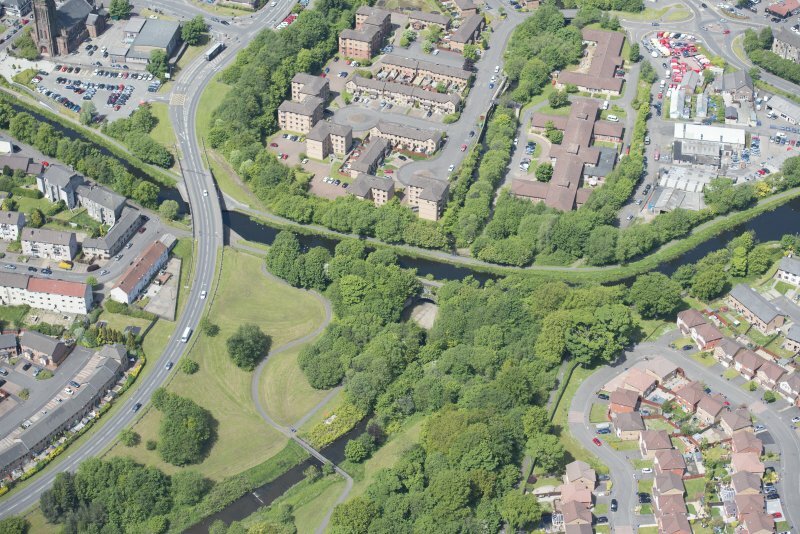 'There is a fine aqueduct over the Luggie at Kirkintilloch'. 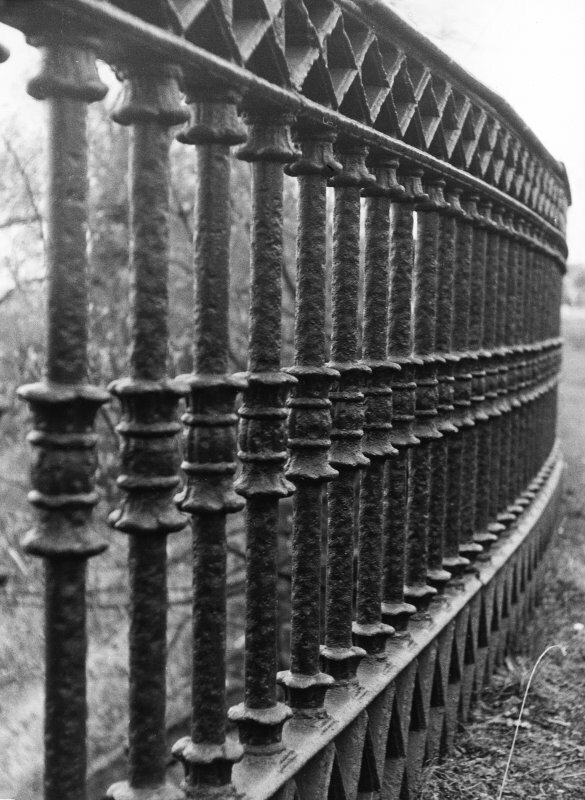 This is an imposing structure comprising a single arch, parapets at the offside and cast iron railings at the towpath. 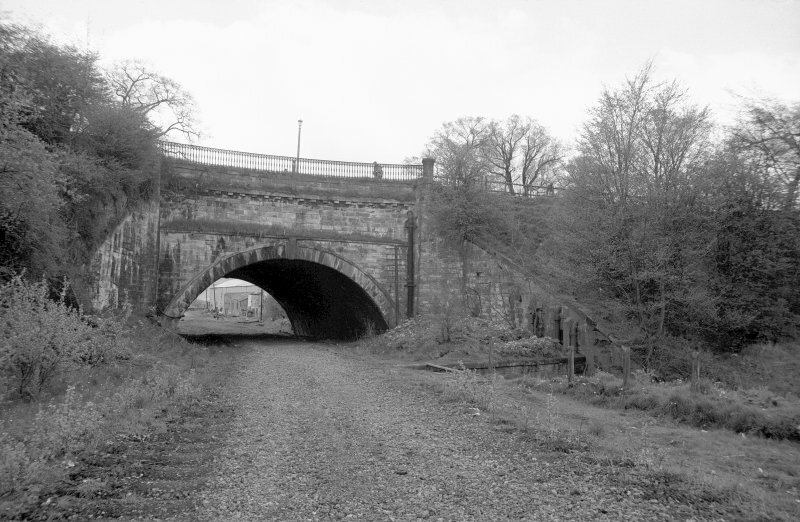 The arch was utilised formerly by the Campsie Branch railway as a convenient location to cross the canal. The water was culverted beneath its tracks. 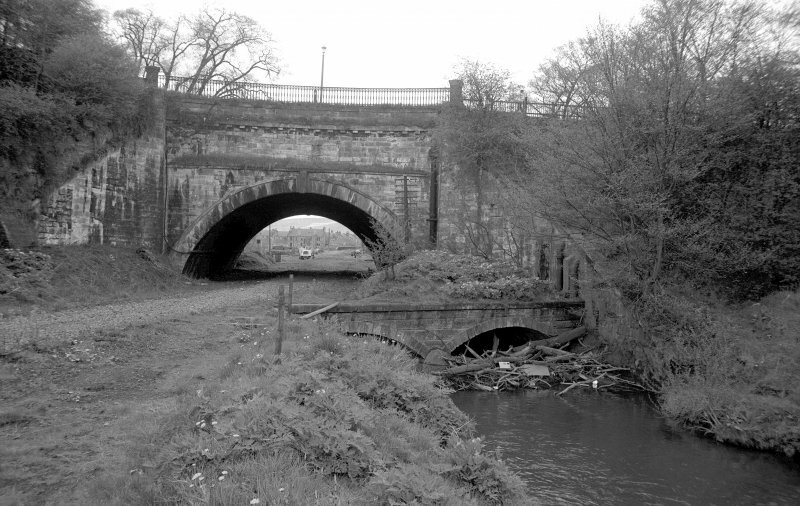 The canal crossed over the Luggie Water on a sturdy single arch, an aqueduct which became known as 'The Unique Bridge,' as the Campsie Branch Railway utilised this route to pass under the canal. There were two smaller arches to the front of the aqueduct, on which the railway passed over the culverted Luggie Water. This fine structure carries the canal over the Luggie Water. In the past it took the canal over a railway line as well. 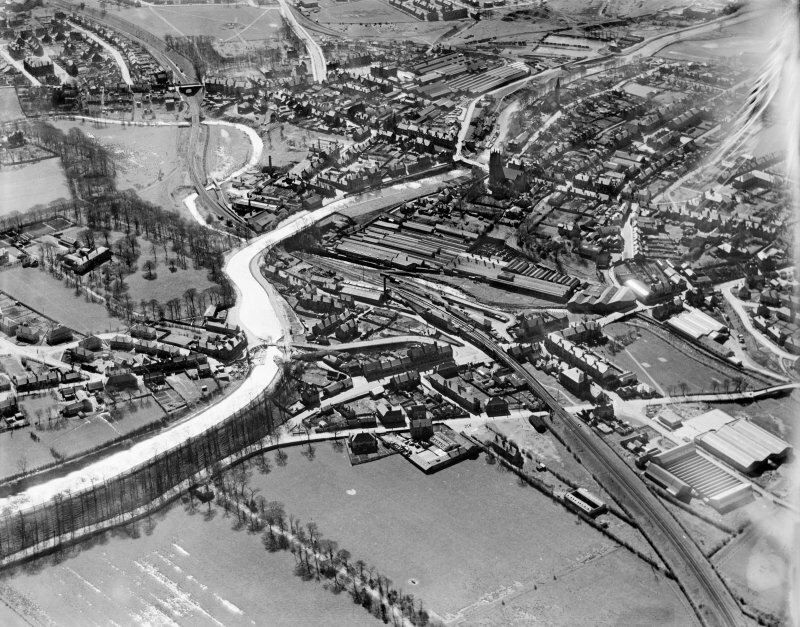 This aqueduct, with both railway and Luggie Water passing beneath, is clearly marked on the 1st edition of the OS 6-inch map (Dunbartonshire 1864-5, sheet xxiv) and also the OS 1:2500 map (1968). The aqueduct over the Luggie Water is still visible on the current edition of the OS 1:10000 map (1991), but the railway has disappeared. Built 1768-75 by John Smeaton (engineer), a single segmental-arch grey ashlar aqueduct carrying the eastern section of the Forth & Clyde Canal over the Luggie Water. A low two-arched bridge beneath the aqueduct was subsequently added to carry a railway over the Luggie Water, and at the time of survey in 2001, had been converted to a footpath. 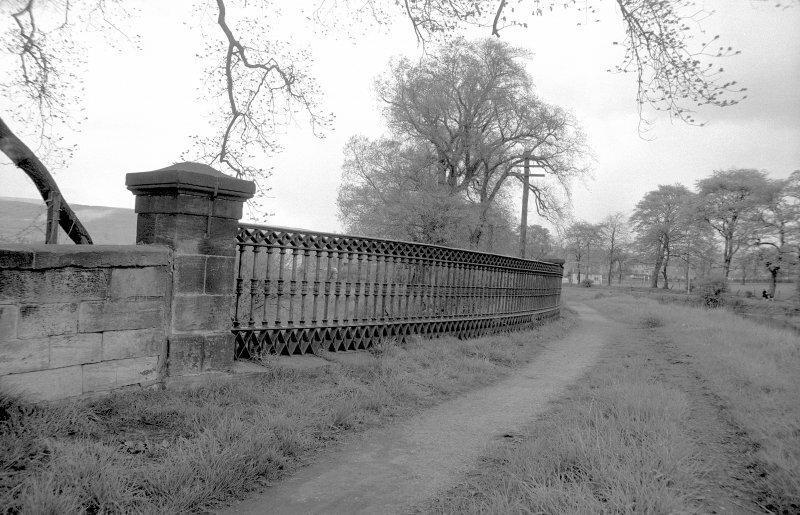 (2001 photographic survey material is stored under 'Forth and Clyde Canal' in the NMRS). Information from RCAHMS (MKO) 2001. 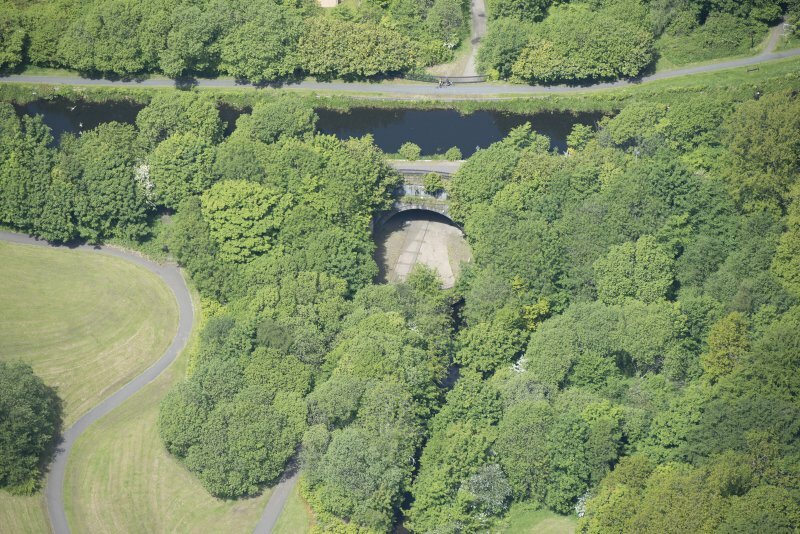 When built, this aqueduct to the W of Hillhead was the crowning glory of the canal so far, nothing like it having been built in Scotland before. It comprises a single impressive arch, of 50ft [15.2m] span and 90ft [27.4m] deep. As if to add to its uniqueness, the contractors (Gibb and Moir, from Falkirk) made the arch in three sections, moving the wooden centring between successive stages. The resulting joints are hard to detect. 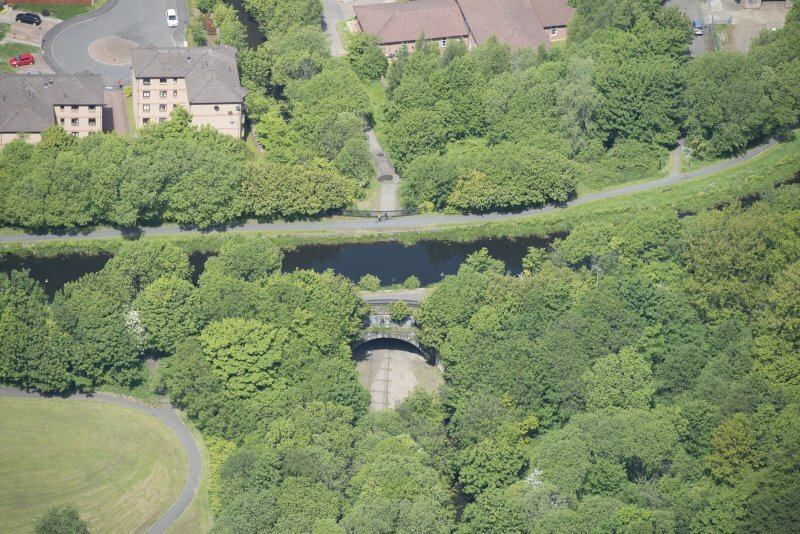 This short aqueduct carries the Forth and Clyde Canal (NS67SE 4/LIN 17) over the Lugar Water a short distance E of the centre of Kirkintilloch. It is depicted, but not noted, on the 1971 edition of the OS 1:1250 map and the 1991 edition of the OS 1:10,000 map. The location assigned to this record defines the centre of the span. Information from RCAHMS (RJCM), 6 January 2006. First major canal structure in Scotland. 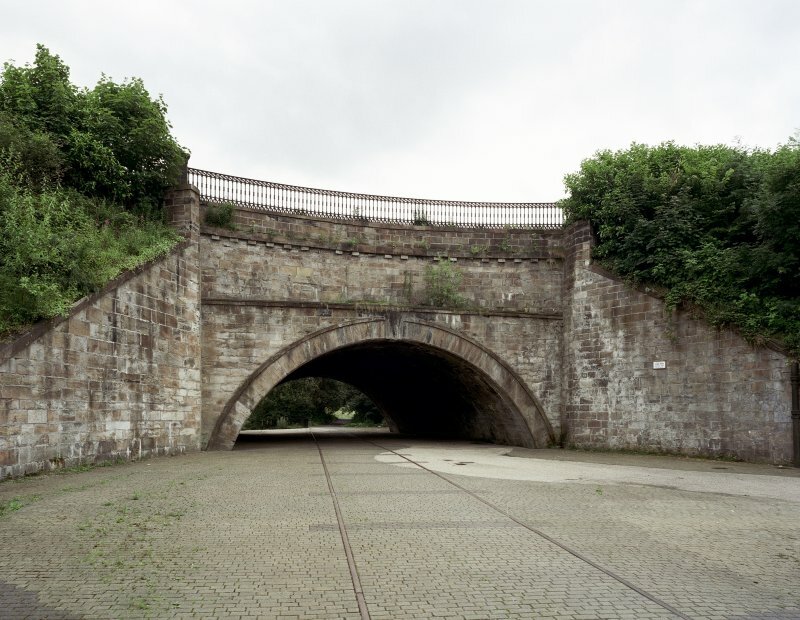 Edinburgh and Glasgow Railway crossed canal through the arch of the Luggie Aqueduct. by Gibb and Muir from 1772–74 and is about 124 ft long overall, 50 ft high and 90 ft wide. The original design was for a single arch span of 60 ft. 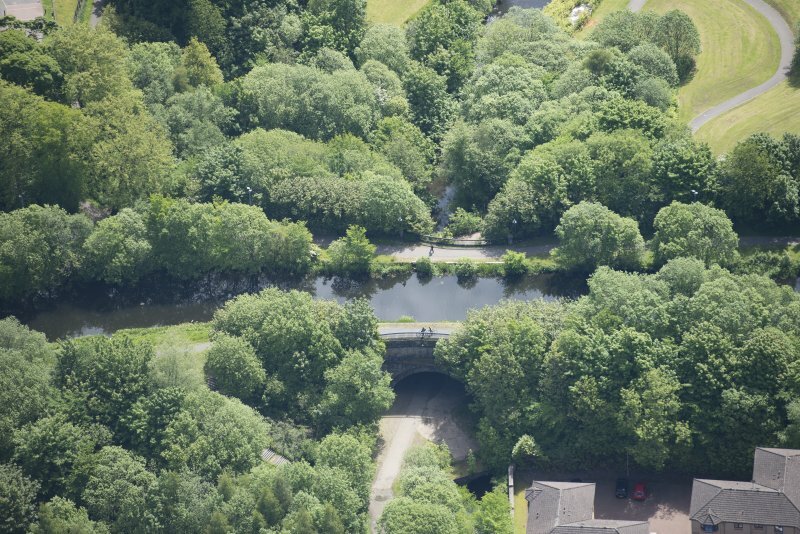 Interesting features are that, unlike at Kelvin Aqueduct, the canal passes over the Luggie at full width providing the operational benefit of uninterrupted two-way passage; horizontal side arches adjoining the waterway are provided for lateral stability; and the 90 ft tunnel of the arch was built in three stages by means of a full spantimber centring devised by the contractors which moved on rollers. The two joints are scarcely discernable. The lateral arches have a rise of about one-tenth span and bear on the abutment walls at their ends. 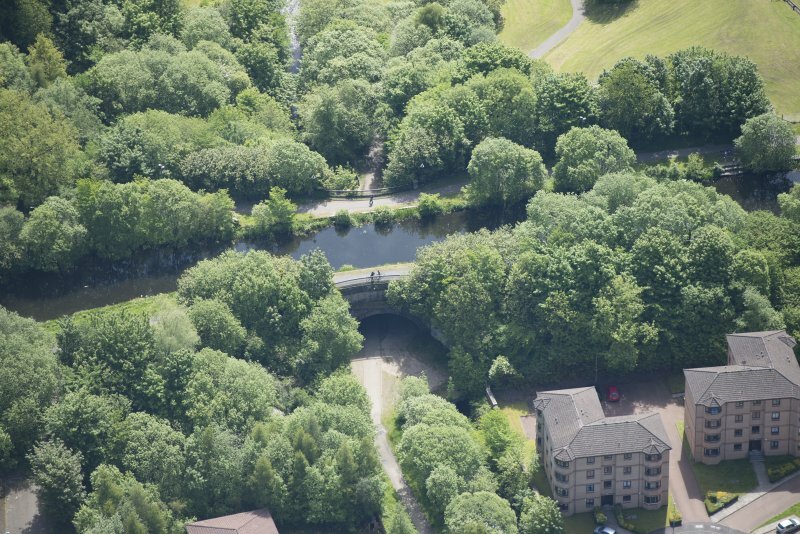 In 1858 the Campsie Branch of the Edinburgh & Glasgow Railway was constructed, crossing the canal through the arch of the Luggie Aqueduct. The Luggie Water was contained within a twin-arched culvert to allow the railway to pass over it. 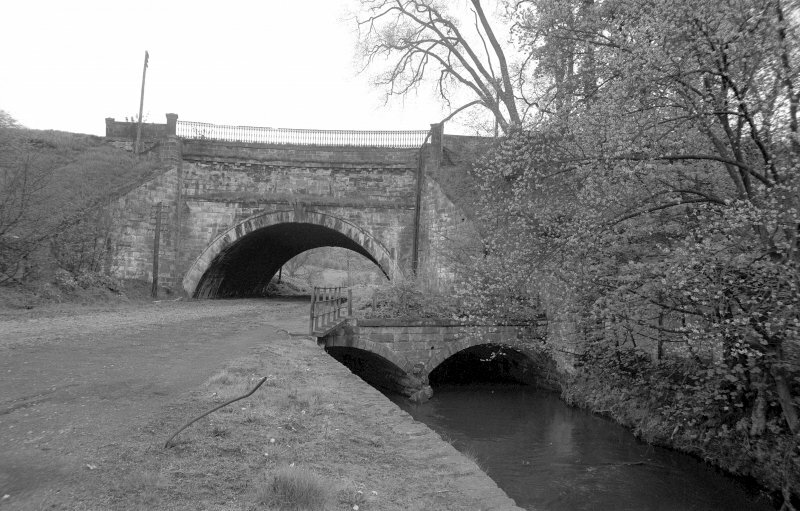 In 1774 an aqueduct (Category A-listed, fig 29.5) was built to carry the canal over the Luggie; later it would also carry the Campsie Branch railway (fig 29). It has been described as a handsome construction of solid masonry with wide arches spanning the river.